Step 1 Trim the crusts from the loaf and cut the bread in 1-inch cubes, arrange them on a baking sheet and bake in a low oven until they are crisp to the touch, about 1 hour. If the loaf is already stale, just cut in cubes. Step 2 Trim the ends from the cucumbers, cut them in half lengthwise and use the tip of a small spoon to scoop the seeds from the center. Cut in 1/2-inch half-moons and place in a strainer. Toss with 1 teaspoon salt and leave to drain for 30 minutes. Step 3Cut the onion in 1/4-inch half-moons and place in a bowl of cold water to cover to stand for 30 minutes. Step 4In a small bowl, combine the anchovies, garlic and capers and stir roughly with a spoon to make a chunky paste. Gradually stir in the vinegar and set aside. Step 5Place the dried bread cubes in a colander and rinse under running water. They should be moistened but not soaked. Shake vigorously to remove any excess water. Step 6Transfer the moistened bread cubes to a large bowl. Add the tomatoes and the drained red onion. Rinse the cucumbers until they no longer taste salty, pat dry and add to the bowl. Step 7Briskly stir the vinegar-anchovy-caper mixture, slowly adding the olive oil to make a coarse, chunky vinaigrette. Pour over the bread mixture and toss to combine. Set aside for at least 30 minutes. The dish can be prepared to this point a couple of hours in advance and refrigerated tightly covered. Step 8Bring to room temperature, then just before serving fold in the basil and serve. In Recipes-list.com we have selected the most viewed recipes from category - Breads Leftovers . Enjoy the best recipes specially selected for you! 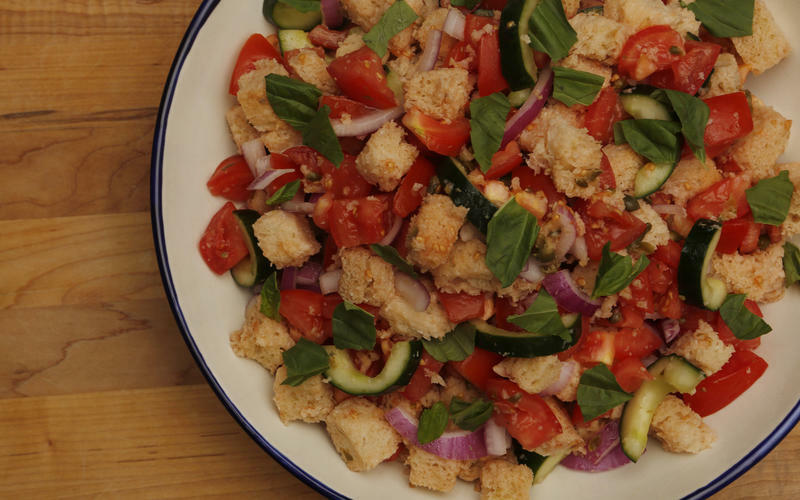 Panzanella is the right choice that will satisfy all your claims.